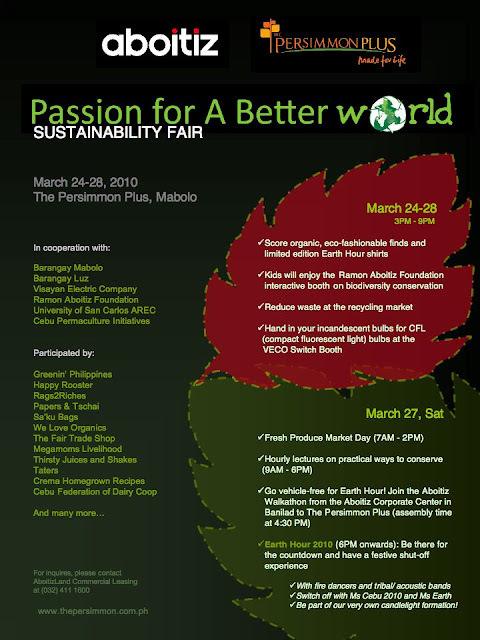 Matudnila.com - A Cebu Events Blog: Aboitiz Persimmon Plus celebrates Earth Hour 2010 by a Sustainability Fair! Home Ramon Aboitiz Foundation Triennial Awards Aboitiz Persimmon Plus celebrates Earth Hour 2010 by a Sustainability Fair! Aboitiz Persimmon Plus celebrates Earth Hour 2010 by a Sustainability Fair! * Score Organic, Eco Fashionable finds and limited edition earth hour shirts. * Kids will enjoy the Ramon Aboitiz Foundation interactive booth on biodiversity conversation. * Reduce waste at the recycling market. * Hand in your incandescent bulbs for CFL (compact flourescent light) bulbs at the VECO Switch booth. With Fire Dancers and Tribal/Acoustic Bands. Switch off with Ms Cebu 2010 and Ms Earth. Also be part of the Candlelight formation. 0 comments: on "Aboitiz Persimmon Plus celebrates Earth Hour 2010 by a Sustainability Fair!"